1. A packet radio link be established to link the Bay Area to other areas in California, particularly Southern California. 2. We, as a group, should encourage greater participation in packet radio. 3. Our group should have low membership dues, and no initiation fees. However we must have enough capital to fund our projects. 4. We should consider merging our group with the national AMRAD group. 5. We organize to form a local group with specific objectives. This group should have a non-profit status and be incorporated. 6. A better mailbox system be established for packet. 1. We shall form an association of individuals with the intention of incorporating into a non-profit organization at a later date. 2. 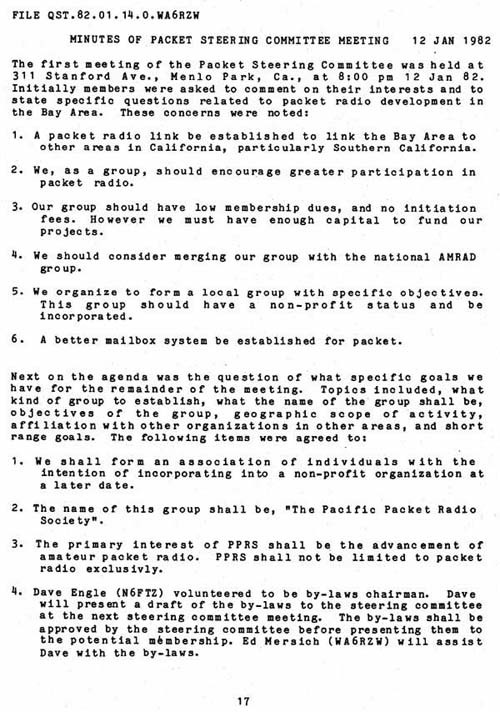 The name of this group shall be, "The Pacific Packet Radio Society". 3. The primary interest of PPRS shall be the advancement of amateur packet radio. PPRS shall not be limited to packet radio exclusively. 4. Dave Engle (N6FTZ) volunteered to be by-laws chairman. Dave will present a draft of the by-laws to the steering committee at the next steering committee meeting. The by-laws shall be approved by the steering committee before presenting them to the potential membership. Ed Mersich (WA6RZW) will assist Dave with the by-laws.